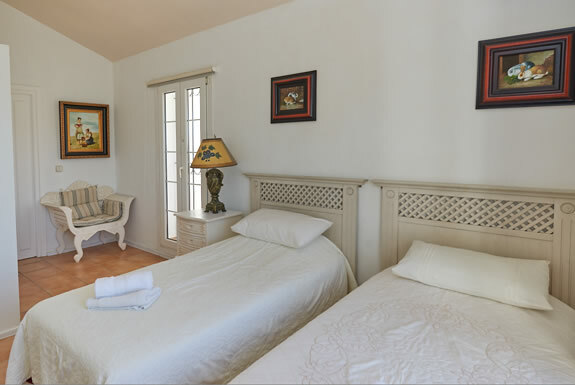 Chantry House is a lovely spacious villa set in lush tropical walled gardens that are surrounded by many palm trees. 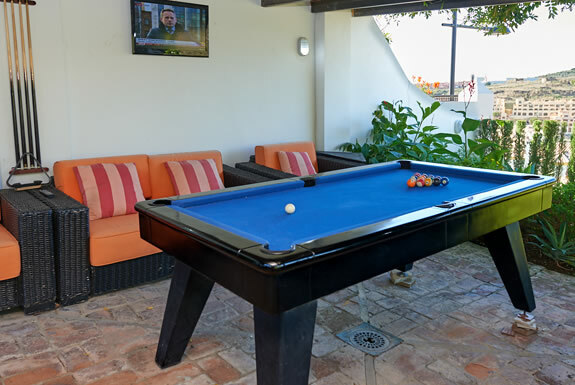 There are numerous terraces and shaded seating areas, a Jacuzzi and a large pool ... relax in the shade or cool down in the refreshing water of the pool. 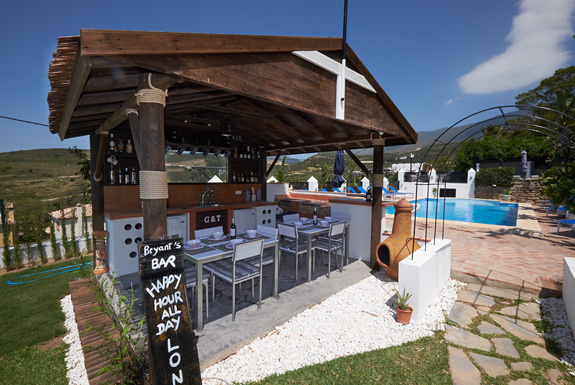 Located in the hills of Estepona overlooking Valle Romano ... the valley of the Romans where Julius Caesar once made his base in Southern Spain ... the local white village of Casares is named after him. 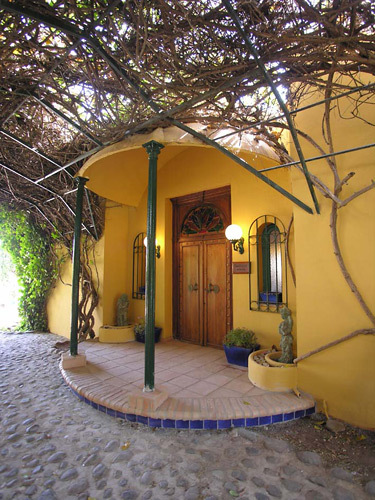 Chantry House is only 5 minutes by car from the golden sandy beaches of Estepona and 10 minutes from the old town. Chantry House - something rather special. At Chantry House we can also accept reservations for small weddings & receptions (less than 75 guests). There is though an extra charge for this service. 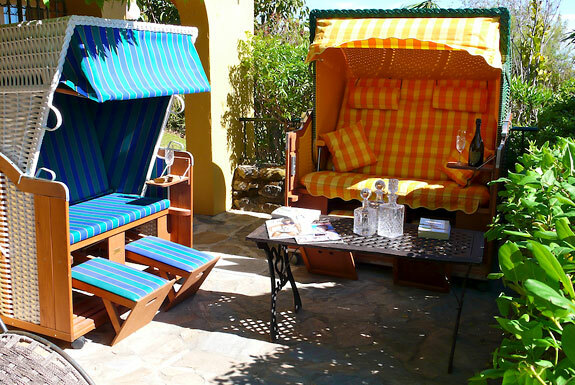 All the above rates are for a maximum of 14 guests + an infant in a cot/crib (hire of cot/crib is extra) and includes: pool maintenance & all linen/towels (except beach towels). 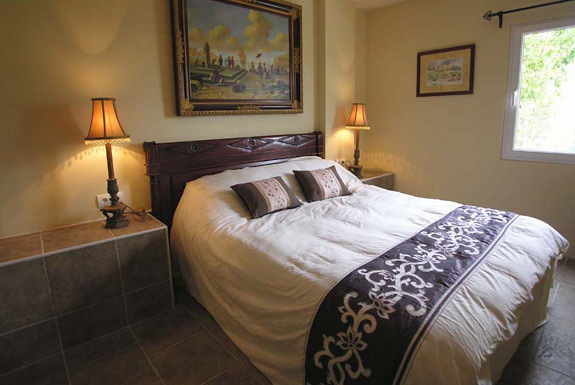 For bookings up to 10 nights the maid service will be on your day of arrival and day of departure only. 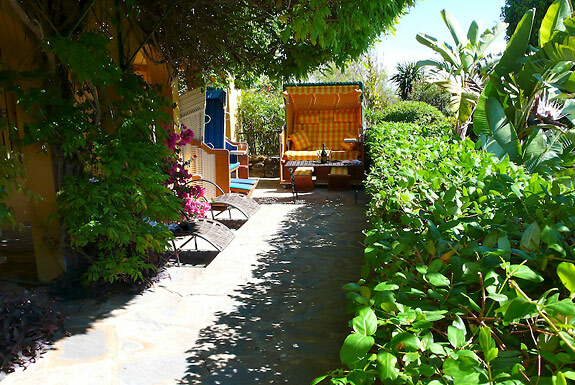 Bookings for 11 nights or more will also have a mid stay linen/towel change and clean. We don't take a damage deposit, but in addition to the above rates there is a mandatory accidental damage waiver (ADW) fee of £10.00 per person, per booking. 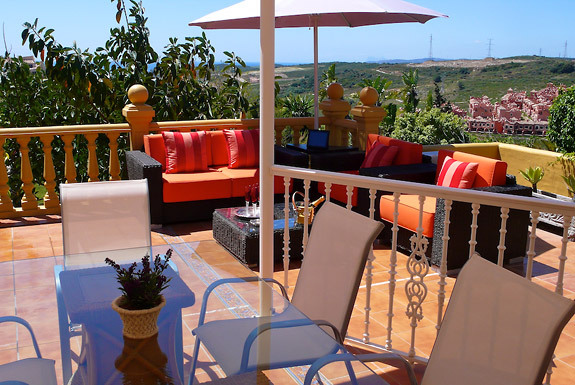 This is to cover you for any accidental damage that may occur in your property during your holiday, this will cover you up to the value of £150.00 per person. 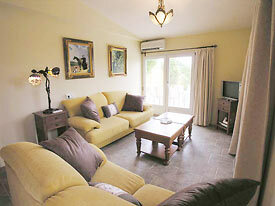 A 25% deposit is required at time of booking with the balance payable 10 weeks before occupation. On arrival you will drive up a cobbled driveway surrounded by mature tropical gardens. The entrance to Chantry House is through a large, antique doorway under a welcoming archway of entwined ivy. The hallway opens onto the main lounge that has a flat screen TV, DVD, & IPTV full package (see features for details) and CD/cassette/radio. 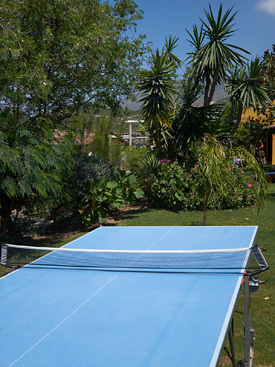 The property also benefits from Wi-Fi ADSL Internet (bring your own computer). Off this lounge you will find the large master suite with a king size bed, French doors opening onto the front balcony, a dressing area with a sofa and coffee table and a en suite bathroom containing twin sinks, and a one piece carved marble bath (reputedly from Sean Connery's old Marbella house! ), the water pours out through a gold lion's head! 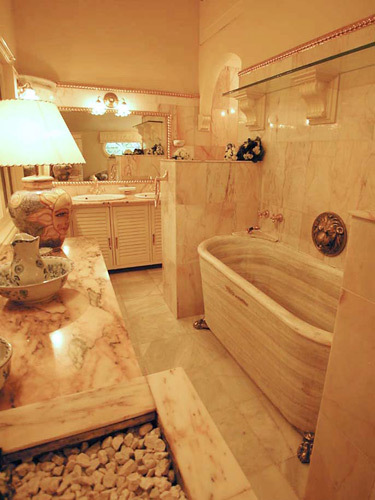 If this is isn't extravagance then what is? 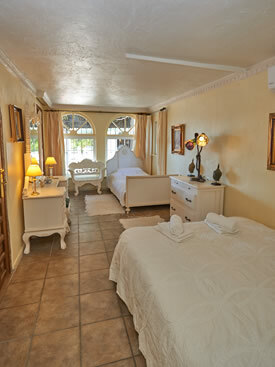 On the other side of the lounge you will find a twin bedded room with a large en suite walk-in-shower room, WC and basin. 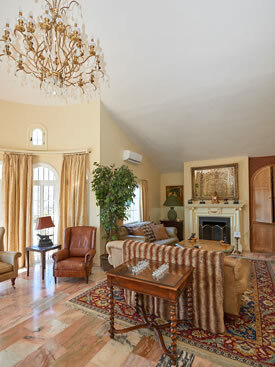 This room has French doors opening directly onto a side terrace with shaded dining and chairs. From the front hallway you enter the second lounge by going down a flight of stairs, this lounge/dining room has a flat screen TV, DVD & IPTV full package (see features for details). 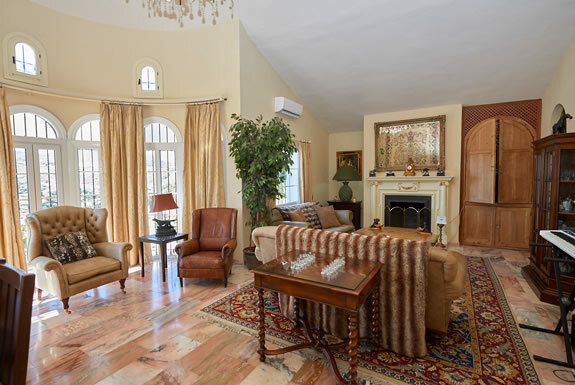 This open plan room also has a lovely round dining table for 10 and French doors that open directly onto the lower terrace with the Jacuzzi and outdoor dining for 12. From this lower terrace you can access the pool area. 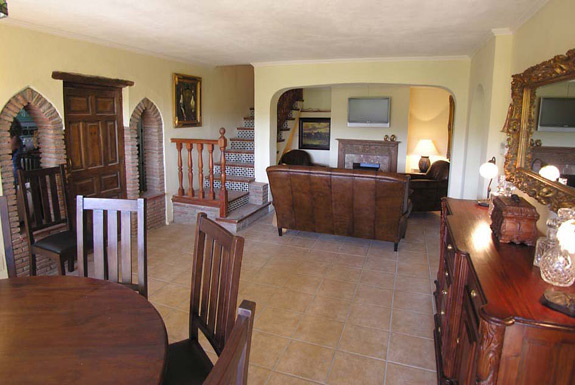 On one side of the lounge/dining room you will find a separate cloakroom with WC and basin and the second twin room. 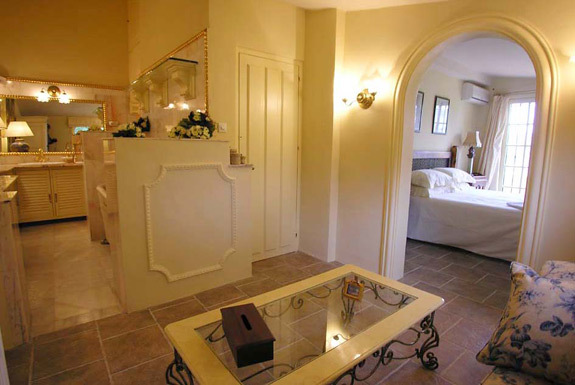 This room has an en suite bathroom with a walk-in shower, WC and basin. 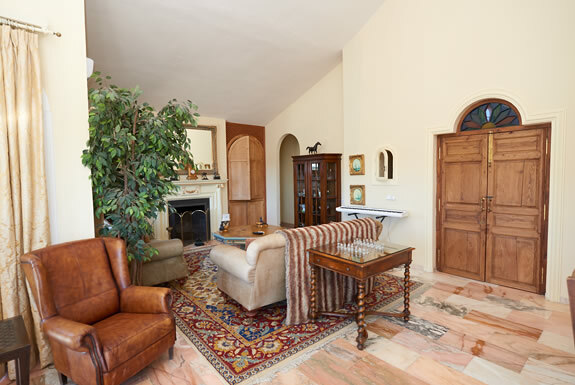 This room also has French doors that open out directly onto the front terrace. 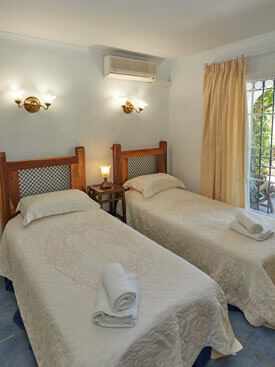 Through this twin room you can access the second spacious double bedroom with a king size bed and a single bed. 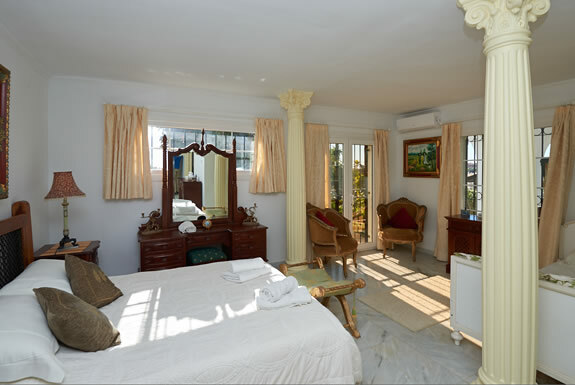 This fantastic room has large fitted wardrobes, roman pillars!, flat screen TV and large en suite bathroom with corner bath, walk-in-shower, WC and basin. 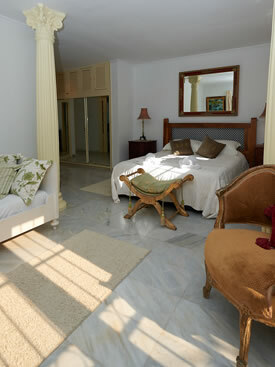 This room can also has access directly to the pool terrace. 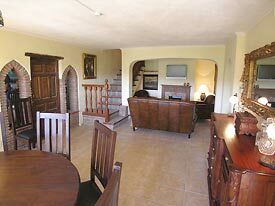 On the other side of the lounge/dining room you will find the kitchen fully equipped with electric oven & ceramic hobs (stove tops), microwave, large fridge/freezer with ice maker & filtered water dispenser, dishwasher, coffee maker etc. 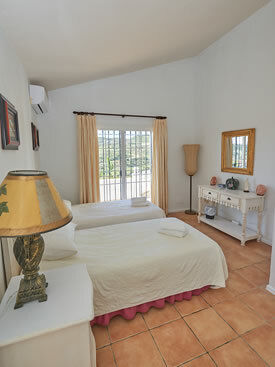 Through the kitchen you will find the family suite comprising of; a triple with a king size bed and a single bed, then into a connecting room a twin with bunk beds. 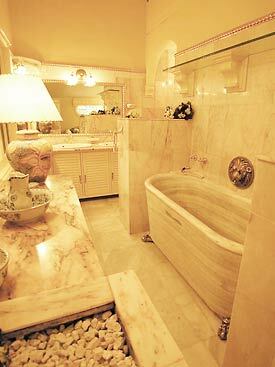 This family suite has a walk-in-shower-room with WC and basin. 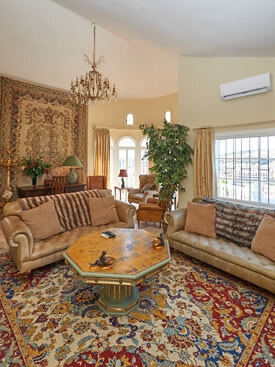 This family suite also has direct access to the outside terrace that overlooks the pool. Please Note: In the main house there are 3 separate TV's but just one IPTV system ... these TV's can only watch the same channel. 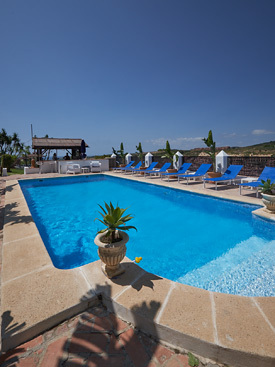 The large private heated pool (10m x 5m) is perfect place to cool down after you've soaked up that Spanish sun. 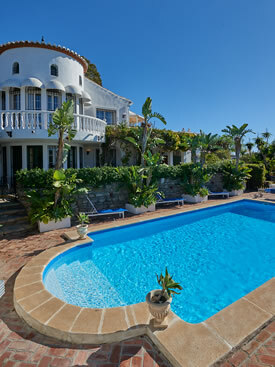 The pool has large roman style steps and is gated by a low fence. 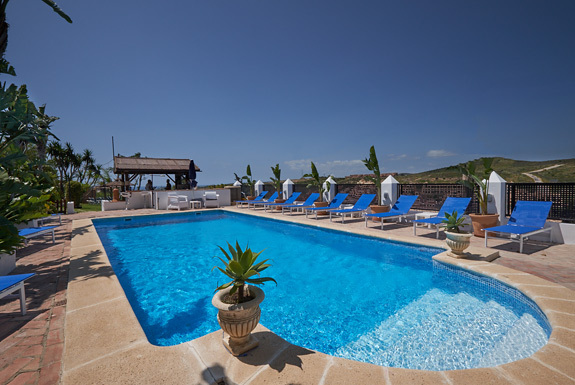 The pool is accessed by the lower terrace. 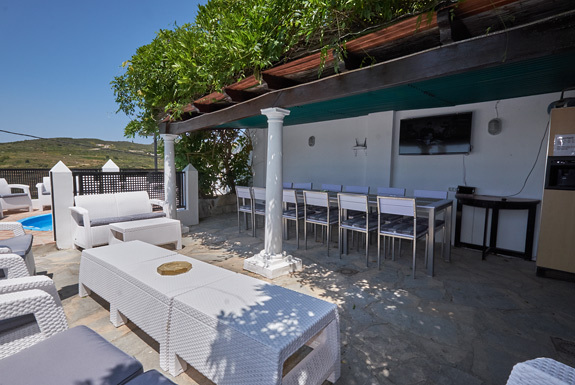 On the lower terrace you will find the Jacuzzi and a large outdoor dining table with seating for 12. 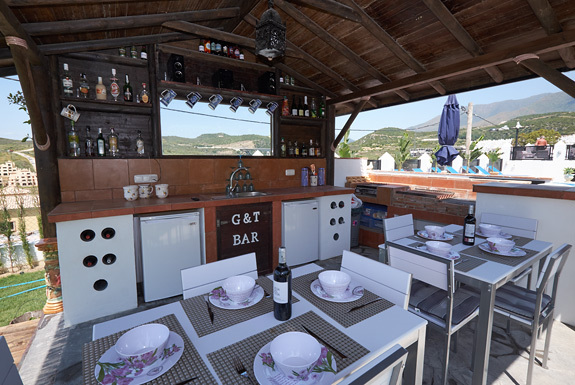 There is also an outdoor fridge & TV on this terrace. 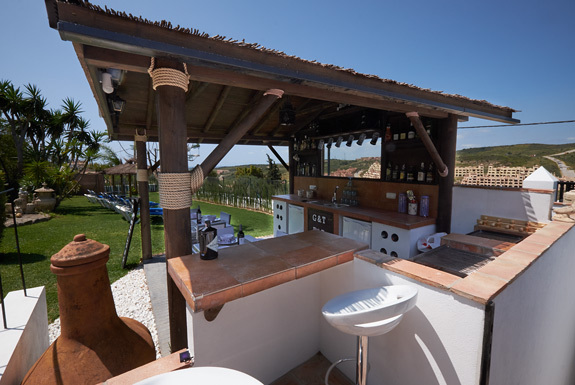 The pool side bar is fully equipped with a wireless speaker, fridge, sink, BBQ and hot plate .... this is the perfect place to enjoy a drink while cooking up a BBQ for friends & family. 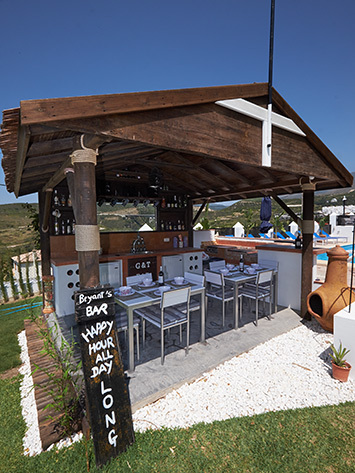 The owner offers a complementary stocked bar including a range of spirits & soft drinks. 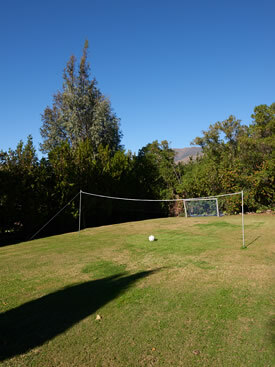 In the mature gardens you will also find a badminton set and a croquet lawn. 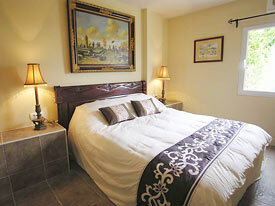 This separate apartment consists of a master bedroom with a king-size bed and en suite shower-room with WC and basin. 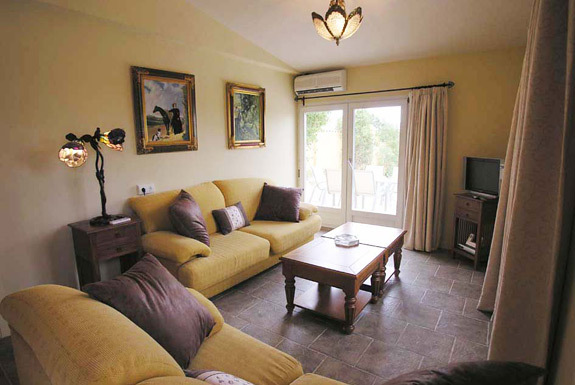 The lounge/kitchen has a flat screen TV, DVD player and SKY TV (free to view pack). 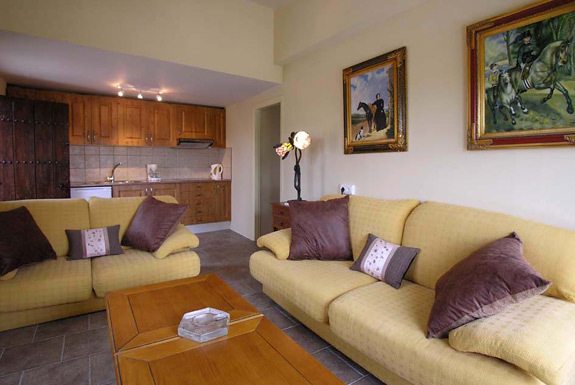 There is seating for 4 and one of the sofas converts into a double sofa-bed. 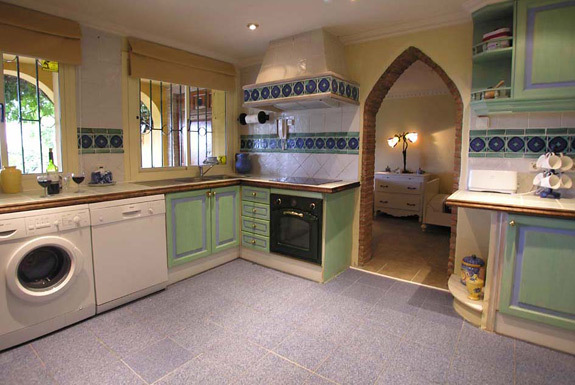 The kitchen is equipped with electric ceramic hobs (stove tops), microwave, fridge and washing machine. 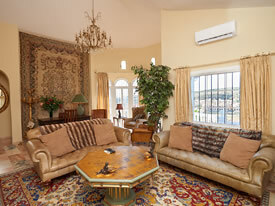 The apartment is fully air-conditioned. 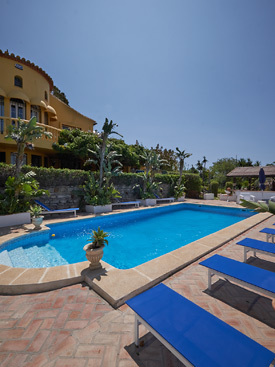 Estepona has a wide range of beaches from the popular La Rada in the centre to the family friendly El Cristo beach, just outside town. This beach is perfect for children, set in a delightful sheltered cove. There are also two new beach "chiringitos" that serve mouth-watering snacks and seafood. 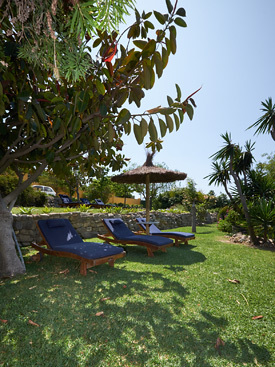 The photograph to the left is of Bikini Beach which is located at the far end of Estepona La Rada beach. 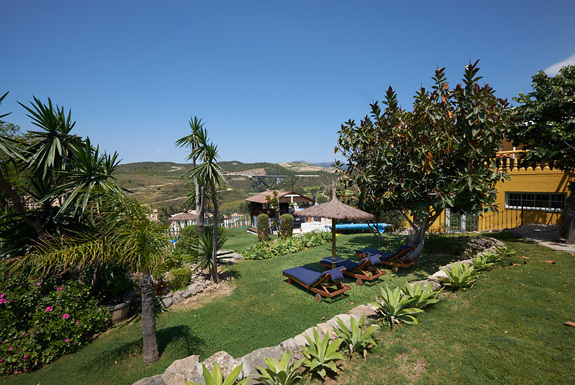 Andalucia is home to sprawling National Parks, dramatic mountain scenery, white villages, beaches and many leisure activities. 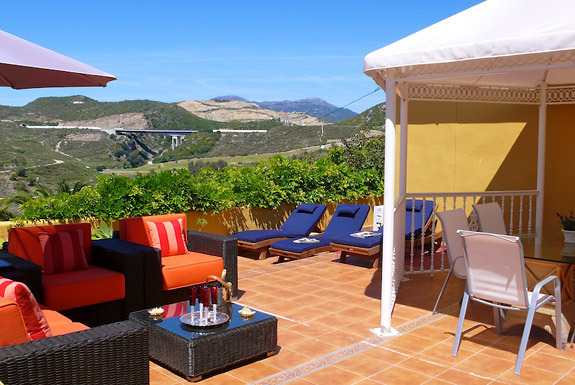 Venture just a short way inland to uncover the delights of the "Real Spain" - an area peppered with traditional Spanish restaurants (ventas) amid breathtaking mountain views. 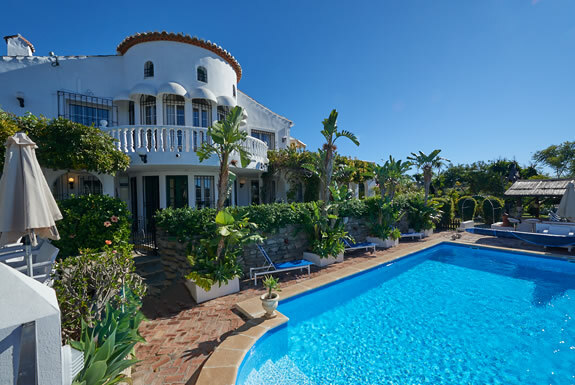 A visit to Gibraltar is only a 30 minute drive and Puerto Banus near Marbella takes just 20 minutes by car. This stylish town is great for designer shopping, people watching, restaurants and night life. 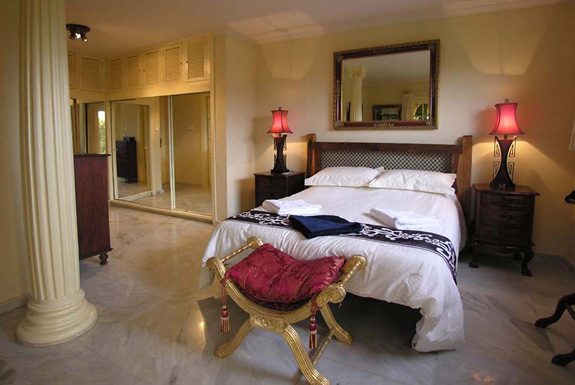 This family holiday region has lots to offer you for your memorable stay. "Dear Janet, Please find enclosed the keys for Chantry House, we had a great time is this beautiful villa. 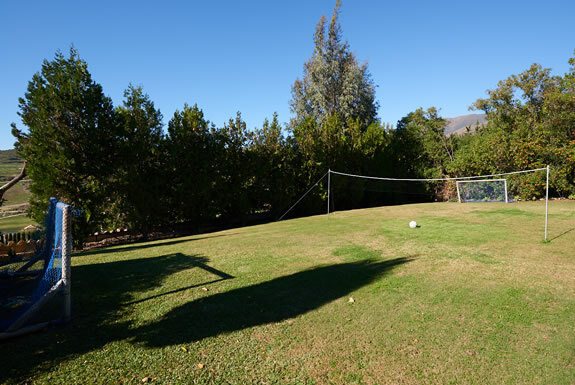 We were happy to find that it was exactly as described, and the pictures on your web site 100% accurate. The weather was fabulous, and we had a very relaxing week. 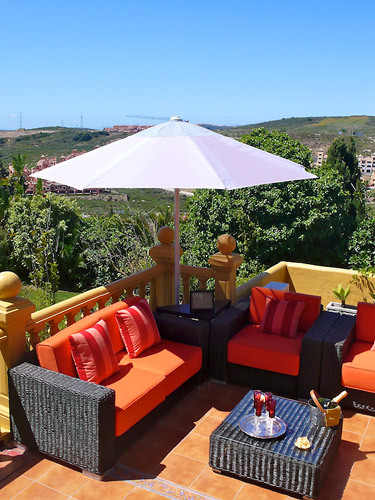 We would be happy to recommend both yourselves & this particular villa to anyone with complete confidence."